Lynn Smith, 64, takes as much pride in the region’s public lands as he does in his Hayden-area backyard. The volunteers Smith coordinates in a partnership agreement for maintaining Idaho Panhandle National Forest trails are “a godsend” said Andy Boggs, Coeur d’Alene District trails manager. “We can depend on them to take care of some of our most popular trails,” he said, noting that volunteers from several groups help the agency stretch reduced funding for recreation programs. Smith has applied his muscle to controlling weeds on Spokane’s South Hill Bluff trails, maintaining routes on the Kettle Crest and clearing trails along the Little Spokane River after the 1996 ice storm. He’s chipped in on the Washington Trails Association’s current campaigns to improve trails in Liberty Lake County Park and build new trails and bridges in Mount Spokane State Park. But his ongoing annual trail maintenance – cleaning, brushing, building water bars to check erosion, decommissioning unauthorized trails – is generally taken for granted. Hundreds of hikers each year trek the popular North Idaho routes to Stevens Lake, Lone Lake and South Chilco Mountain without a clue that volunteers keep the trails open. 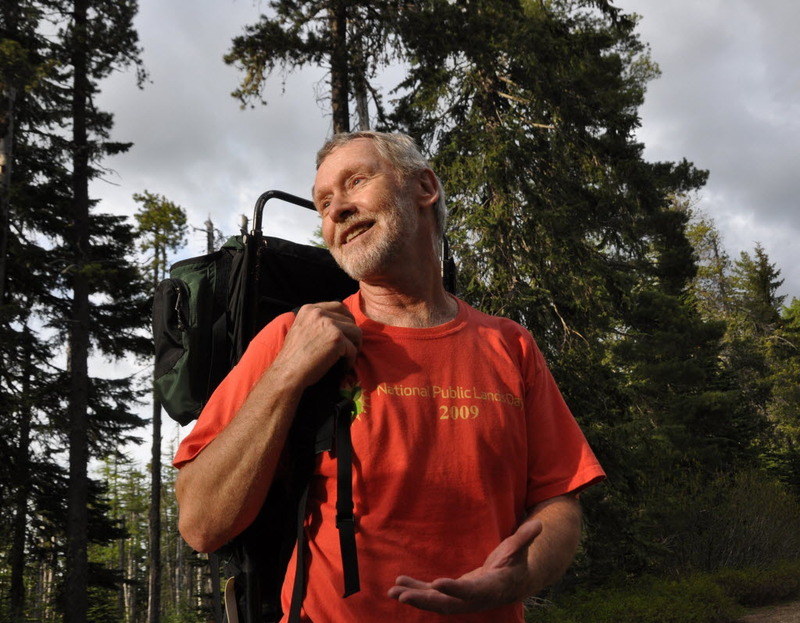 The retired science teacher said his lifelong passion for hiking and backpacking has been a perfect fit for his interest in geology, biology and botany. Trail maintenance satisfies the same personal interests while leaving the landscape in better condition for others to enjoy. “I have different goals when I head out to a trail,” he said. “It could be for conditioning, or to see something new, to find morels or for hunting, but I always try to leave the trails in better shape than when I came. “Enjoying trails a great way to spend the golden retirement years,” said Smith, whose trail-hardened body easily keeps step with much younger volunteers. Trail maintenance is particularly satisfying “because you see the product when you’re done,” he said.